Tomorrow, on the 21th of April I’m celebrating my 50th birthday (yes, time dies, when you’re having fun!). 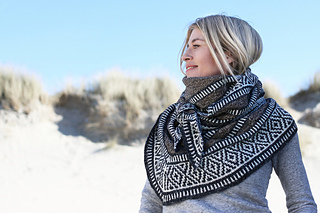 To thank you all for your ongoing support, your inspiration and your appreciation of my work, all of my self published patterns will be 50% off for 24 hours, starting at midnight tonight, Amsterdam time. Maan is not for the faint at heart. She is not a flimsy, barely there layering piece, but a wrap with a lot of character, presence, and substance. 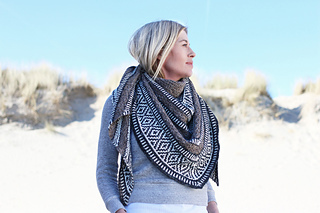 She stands out in the crowd and will add something extra to any outfit while keeping you warm and cozy. She is an eye-catcher, but also your shield. 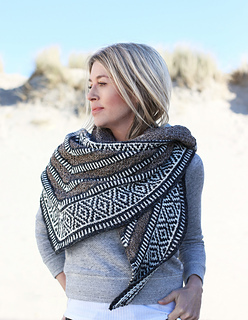 Knitting this wrap is a treat for the adventurous intermediate to experienced knitter. 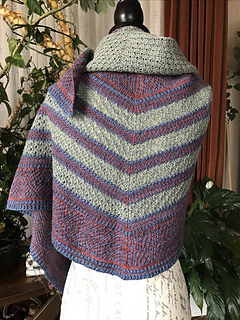 Because of the variety of stitch patterns and techniques, there’s no room for boredom and there’s just enough repetition to get a sense of rhythm and structure. 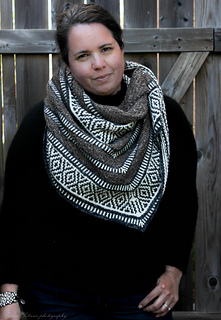 Maan is a large triangle shawl worked top-down, starting with a classic garter tab. All the colorwork is done using the slip-stitch technique, so you will be handling only one strand at the time. 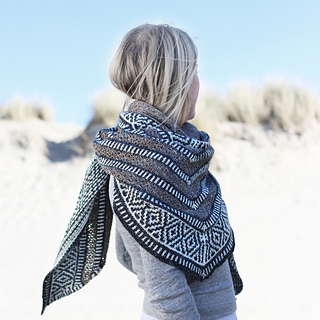 The stitch pattern for Maan is written out and charted, the mosaic colorwork is charted only. Approx 225 cm / 88.5” wingspan along the top edge and 70 cm / 27.5” deep. MC approx 750 m / 820 yards. CC1 approx 500 m / 550 yards. CC2 approx 375 m / 410 yards. Sample shown in Schoppel-Wolle Leinen Los. are all carefully explained in the pattern, but please keep in mind this is not a mindless tv-knit! Test knitters rated the difficulty level as 3 out of 5.